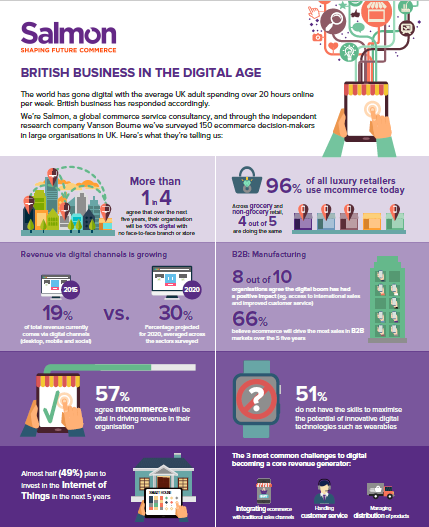 London, UK: 13 October, 2015 – A study from global ecommerce consultancy Salmon, a Wunderman Commerce Company, has explored the most important aspects of digital commerce in Britain, analysing how companies across a range of sectors rate their performance in digital channels. The findings reveal a business world striving to maximise the revenue potential of digital technology but struggling to make that a reality. Despite UK businesses investing in digital commerce, with mcommerce (49%) and desktop ecommerce (81%) already key sales channels, only 19% of total annual revenue currently comes from digital commerce. When asked to pinpoint the challenges faced in maximising the potential of digital commerce, respondents claimed the biggest battle for developing ecommerce as a whole (41%), and more specifically when it came to mcommerce (23%), was the issue of integration with traditional sales channels such as face-to-face and in-store. Handling customer service (37%) and managing the distribution of products when selling to customers (35%) were also noted as challenges. However, businesses need little convincing of the advantages of digital sales channels and in many cases are already experiencing them – 89% of luxury retailers with a mobile sales channel have experienced benefits as a result. Additionally, over two thirds (69%) of respondents highlighted the ability to collect customer data and target customers more accurately as key benefits. Despite the revenue opportunities digital commerce brings, it is clear that businesses face challenges in turning benefits, such as improved brand awareness, into increased sales. The situation is not helped by lack of clear responsibility – 67% don’t have a dedicated team in place – or a plan to deal with the pace of change, with over half (51%) agreeing their organisation does not have the skills to maximise the potential of digital technologies. Looking ahead, as digital technology continues to innovate and new services come into play, businesses are preparing to take advantage, with almost half of all organisations (49%) planning to invest in the Internet of Things (IoT) and wearables within the next five years.